We use social media buttons and/or plugins on this site that allow you to connect with your social network in various ways. For these to work, the following social media sites, which may include, but not be limited to, Facebook, Google+, LinkedIn, Twitter, Instagram, or Pinterest, may set cookies through this site which may be used to enhance your profile on their site or contribute to the data they hold for various purposes. Please research the respective privacy policies of these companies if you are interested in learning more. 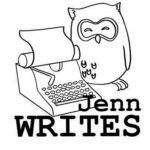 Jenn Writes participates in the Amazon Services LLC Associates Program, an affiliate advertising program designed to provide a means for sites to earn advertising fees by advertising and linking to amazon.ca. Jenn Writes also contains other advertising and affiliate marketing links for shareasale for Mabel’s Labels. A commission on sales of the products that are linked may be earned. There may also be affiliate links from third party websites. Cookies may be used to track these purchases. If you have an account on this site, or have left comments, you can request to receive an exported file of the personal data we hold about you, including any data you have provided to us. You can also request that we erase any personal data we hold about you. This does not include any data we are obliged to keep for administrative, legal, or security purposes. We will not sell, distribute or lease your personal information to third parties unless we have your permission or are required by law to do so. This website may contain links to other websites or posts that we find interesting. However, once you have used these links to leave our site, you should note that we do not have any control over that other website. We cannot be responsible for the protection and privacy of any information that you provide when visiting external websites and such sites are not governed by this privacy statement. You should exercise caution and look at the privacy statement applicable to the website in question. If you have read this far, congratulations! Here’s a fun fact for your diligence (and keeping with the royal theme). The British Royal Family is not allowed to play Monopoly at home because it got too vicious.